We all want to create magnificent websites on our own but are often hindered due to the lack of resources. Those of you who aren’t programming literate or can’t afford to hire a web developer have probably heard of drag and drop theme builders. In this article, we’ll take a look at the best drag and drop theme builders for WordPress. We’ll highlight the standout features in each and make it easier for you to pick one for your next WordPress site. 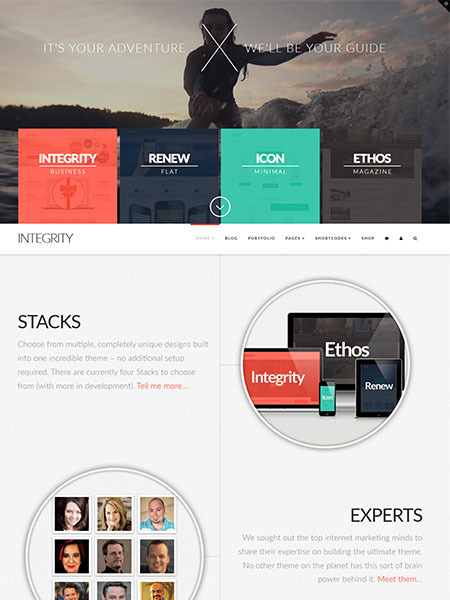 Divi is a multi-purpose theme builder designed by Elegant Themes. It is an incredibly handy builder that makes it easy for anyone to create dynamic sites without any prior programming knowledge. Users can also check out their demo before purchasing it. Divi builder is its drag and drop site designer that enables users to create themes and layouts. It transforms content modules and elements into visual building blocks. There are no limits on the customization of these builder elements which ensures that users can create professional-looking, original sites in no time. 18+ pre-made layouts to pick from. 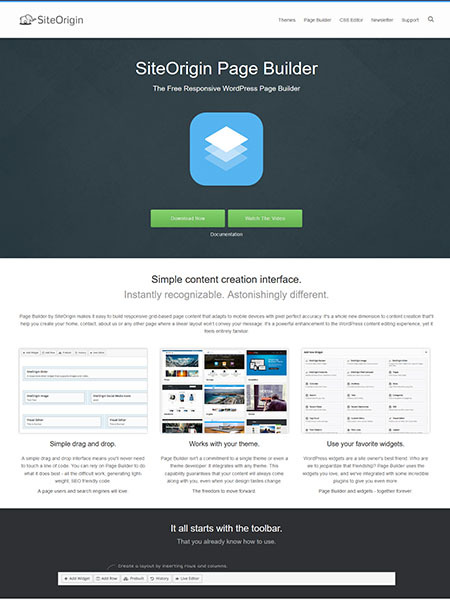 40 drag and drop content modules to help you create your site. Themify Builder comes with the full collection of themes designed by Themify. It enables users to leverage the page builder’s power to the max by designing for both the frontend and backend of their WordPress sites. The page builder provides a set of pre-built layouts that users can get started with and the ability to import custom layouts they may have created in the past. The underlying code of every theme designed with Themify Builder is responsive, SEO friendly and translatable. Support for WordPress Multisite installations. Supports parallax scrolling and video backgrounds. Elementor is a drag and drop, live page builder for WordPress that enables webmasters to create high-end designs without having to code. This open source front-end page builder ships with all of the design features you could possibly need. The page builder is incredibly easy to use and its controls are tailored to provide an optimal user experience to its users. With Elementor, users can fully customize their site’s layout down to every last pixel which includes resizing columns, modifying section dimensions, and positioning columns and content. Huge library to choose design elements from. 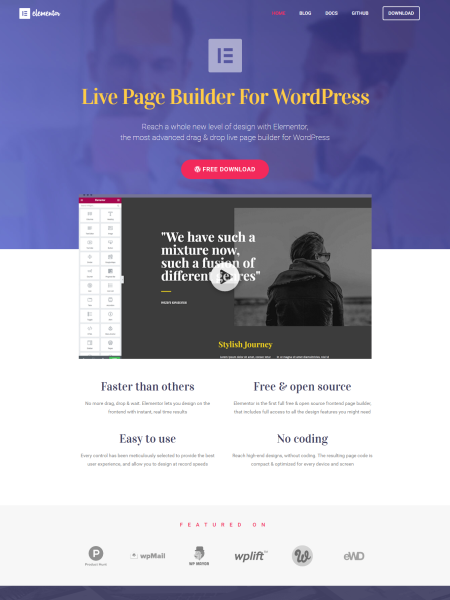 Fully responsive, front-end live page builder. Comes with pre-designed templates and widgets. Integrated with Google Fonts and Awesome icons. 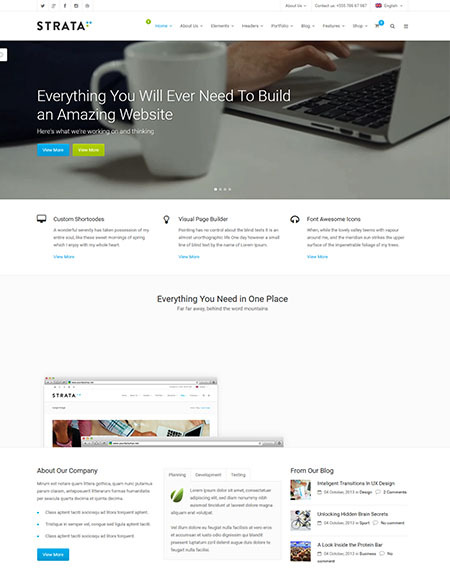 X Theme is currently on the best-sellers list at ThemeForest. This page builder’s design and features are unique in that they are based on recommendations from professionals in the online marketing domain. SEO experts, WordPress professionals and Google AdWords specialists came up with the most powerful design that will help you monetize your site through the X Theme page builder. It enables users to create high conversion pages that are fully responsive and Retina ready right out of the box. Users can start out with any of the four pre-built layouts to get started. Several layout options to pick from. 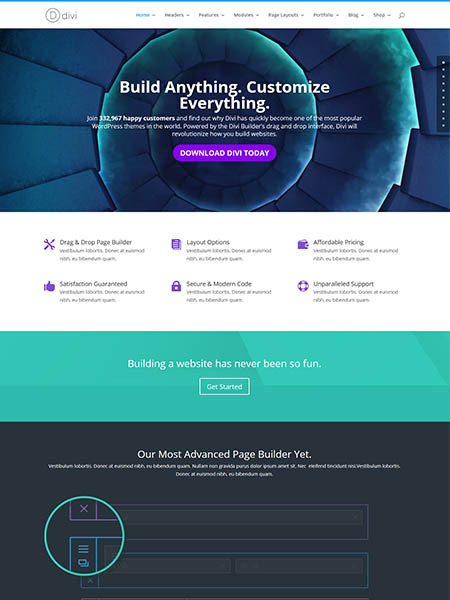 Beaver Builder is by far one of the easiest page builders to use. Users have noted that Beaver Builder provides a degree of familiarity as if they were using photo editors and text editors to design the entire page. The page builder comes with over 20 page templates and integrates seamlessly with popular plugins such as WooCommerce to cater for e-commerce sites. All templates are search engine optimized and developer friendly for anyone who wants to make add some serious customization to their pages. Live frontend editing and preview. CSS Hero is here to save the day for every WordPress enthusiast who finds it difficult to customize pages with CSS code. It is the definitive WordPress plugin that enables users to customize every property of their themes with an intuitive, drag and drop theme builder. The plugin integrates with Google Fonts giving users access to a ton of typography options and enables them to leverage its built-in special effects feature to add elements with Hover Fx, Shadows, Transitions and much more. Keep track of edits for A/B split testing. Option to commit device specific edits. Quards is a plugin designed to simplify the task of making landing pages in WordPress without the need for any coding skills. The interface offers a variety of pre-designed blocks or “cards” that can be dragged into place and edited on the fly. Components are organized by category including cover, image, text, feature, grid, menu, footer, and subscribe, and layout options are unlimited. Once you’ve chosen your cards and put them in the order you want, simply click on them to change text and edit fonts and colors. If you want to design a one-page long scrolling WordPress site or landing page with clean modern design using an intuitive simple interface, Quards ticks all the boxes. Strata is one the best drag and drop page builders you’ll come across for an incredibly low price. It is fully integrated with Visual Composer and WooCommerce to support all types of WordPress sites. Strata has something for everyone — whether you’re building a blog or an online store. The Strata page builder supports parallax scrolling, side and drop down menus and is Retina ready right out of the box. 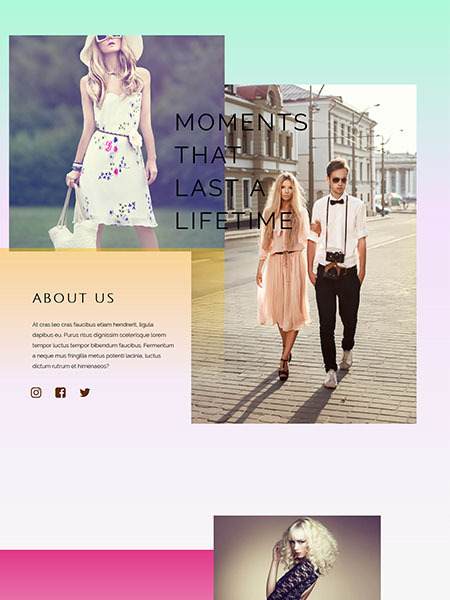 The whole trendy design package rolled into one super page builder! Supports parallax scrolling and HD video backgrounds. Integrates with Visual Composer and WooCommerce plugins. Retina ready right out of the box. 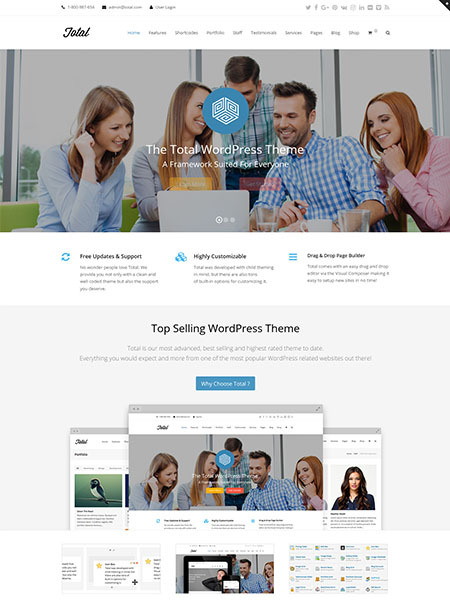 Total is a responsive, multipurpose WordPress theme builder that enables users to design their page’s frontend and backend using a drag and drop page builder. It features live customizations, premium sliders and unlimited color options all packed into one, lightweight theme builder. Total integrates with Visual Composer and WooCommerce easily extending the range of features that are available. One of its standout features is that it offers a powerful theme panel through which users can enable and disable features with one click. Integrated with Font Awesome icons and four premium plugins. 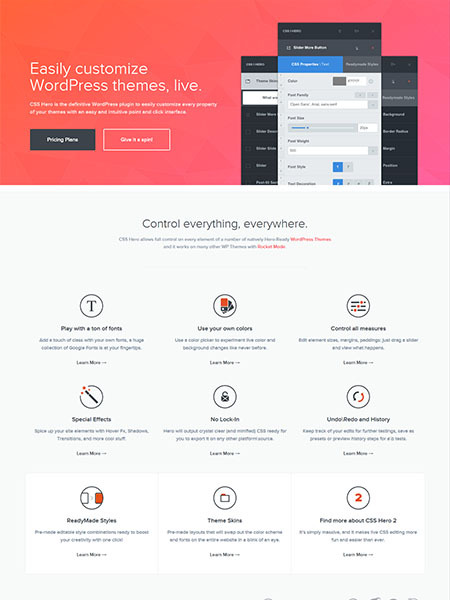 The Theme Foundry’s Make is a lightweight, drag and drop theme builder that has something for everyone – individuals, developers and even business owners. The theme builder makes customization simple and straightforward while putting a range of options forth to personalize themes. Make’s page builder is designed specifically for the WordPress dashboard which makes it even easier to use for WordPress users. It offers over 110 customizer options that enable users to style their sites however they want without touching a single line of code. Fast and friendly support staff. 110+ customizer options, 600+ fonts. Layers is a free page builder that is incredibly easy to use for everyone. The theme provides a code-free interface that gives user full control over the aesthetics and content of their WordPress site while staying in line with the fundamentals of good web design. 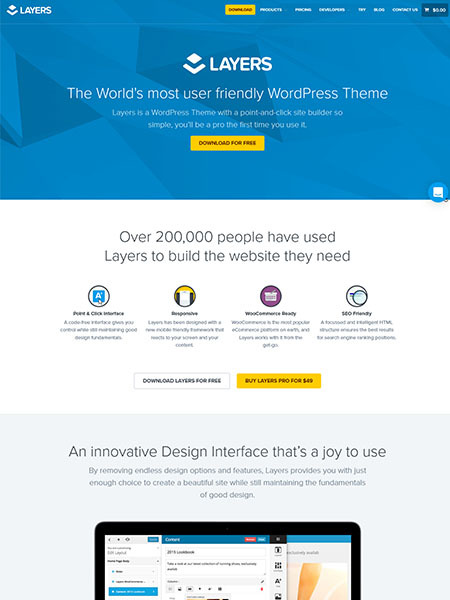 Layers is installed and activated as a WordPress theme which means that it works directly with WordPress’ Customizer. It also offers dynamic typography and a flexible grid structure that complements its ease of use even further. Preset layouts for easier customization. Visual Composer is perhaps the most popular drag and drop theme builder for WordPress that has been downloaded over 500,000 times. It enables users to build the site they’ve imagined using an intuitive drag and drop editor. The plugin doesn’t require users to have programming knowledge to create wonderful site designs. 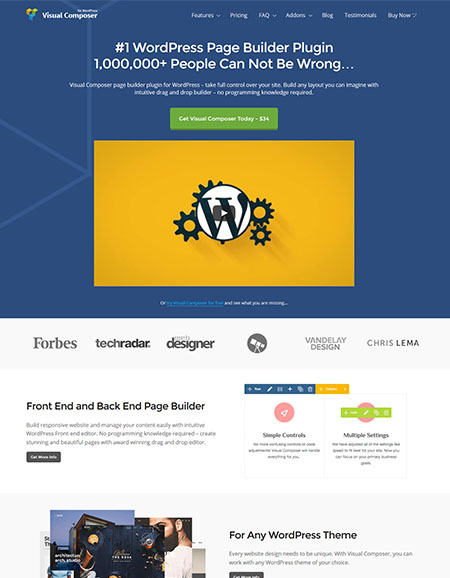 Visual Composer allows users to build both frontend and backend pages and works with any WordPress theme. It features over 40 content elements right out of the box to get you started and a skin builder to tweak its elements to match your site’s brand. Fully responsive design optimized for mobiles. SiteOrigin’s Page Builder provides a simple and intuitive content creation interface that enables users to create responsive, grid-based page content that is mobile optimized. This free page builder works with just about every theme right out of the box and enables users to employ their all-time favorite widgets. Page Builder features a live editor which puts an end to going back and forth between the site editor and preview panel to view the final design. Works with every WordPress theme. Generates precise code in the backend. Live editing that gives you an exact preview. Although Velocity Page is on the higher end of the price scale, the features it has on offer are definitely worth every penny. 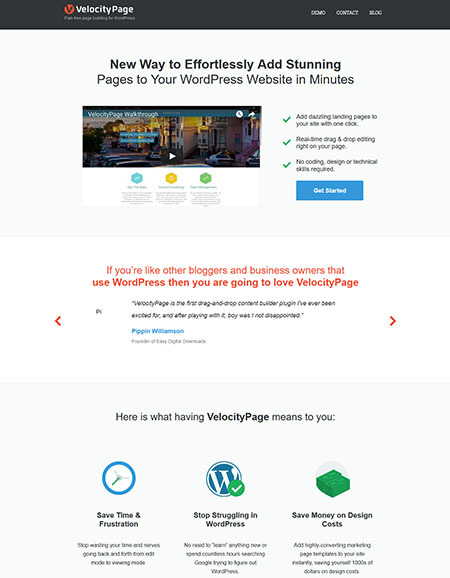 Customizing your site’s page with Velocity Page is as easy as using a word document. Its built-in page builder enables users to edit and view the final page from the same interface saving them the trouble of going back and forth between different modes. Velocity Page provides highly converting page templates for users to pick from. It also enables users to create pages that are responsive and compatible with popular resources such as MailChimp and Aweber. One of its standout features is that it offers layouts for product launch pages. You may also want to read this VelocityPage review, before making a final decision. Fully responsive design and customizable webinar pages. 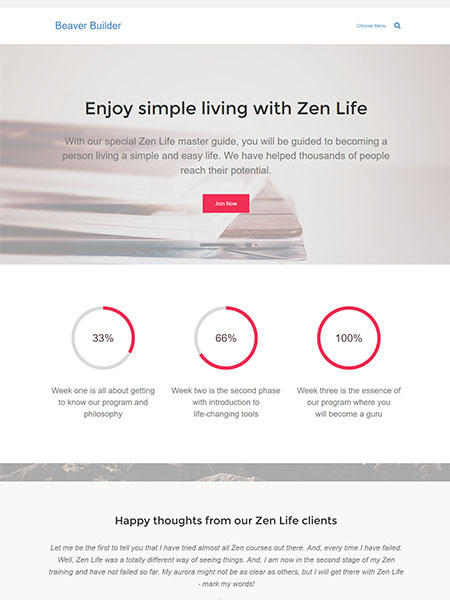 Landing pages compatible with MailChimp and Aweber. If price isn’t an issue and you want a feature rich theme builder — The Velocity Page, Beaver Builder and Themify Builder are the strongest candidates in this category. All three theme builders are feature rich and offer top-notch functionality. If you want the latest trends and tons of templates — Some of us just want the best of both worlds regardless of how much it may cost us. Divi and Strata are the market leaders when it comes to theme builders that focus on the latest web design trends. If your top priority is to increase conversion rates — Those of you who feel that conversion rates are more important than anything else should go for X Theme or CSS Hero. If you’re all about e-commerce — If you’re planning to start your very own e-commerce site or are looking for a theme builder to give your online store the zing it needs then Make, Total, and Layers are the go to theme builders. If your site has a multilingual audience — Those of you who have visitors tuning in from all across the globe would do better with a theme builder that offers support for translations like Visual Composer. If you want the best features in a free theme builder — Those of you who don’t want to empty out their wallets for a theme builder but desire the best functionality should give SiteOrigin‘s Page Builder a shot. There are several drag and drop theme builders for WordPress out there that each have their own set of standout features. Which one you ultimately end up choosing depends on the type of WordPress site you want to create and your budget. For instance, if you’re setting up an e-commerce based website then it’s best to go with a page builder that integrates with plugins like WooCommerce. There’s a page builder out there for everyone who wants to create a professional-looking site without having to code. Which drag and drop theme builders do you use? Let us know in the comments section below. you might want to checkout the page builder we’ve created: it’s called Brix, and it’s drag & drop, responsive ready and really puts you in the driver seat when designing your website. Check out more at brixbuilder.com or simply jump to the free demo and try for yourself! my fav Theme Builder is Visual Composer! Your review left out a vital fact re Elementor Page Builder. There is a Pro version that literally blows all the other page builders away. The free version blows at least 80% of the other page builders out there out of the water.